Imagine a game like Super Meat Boy on the iPhone. Sounds absolutely horrible, doesn't it? A tight platformer full of tricky jumps and timed challenges, all utilizing the iPhone's notoriously dodgy touchscreen controls? 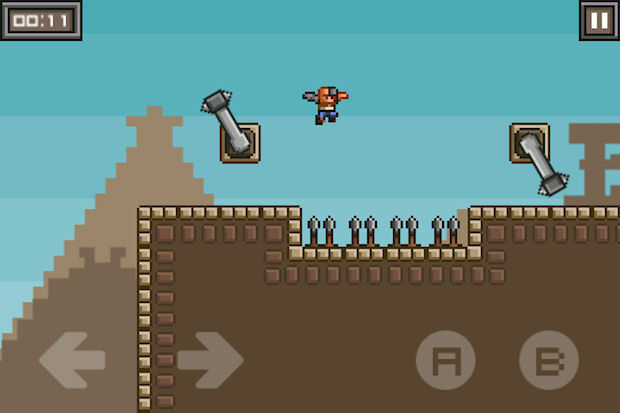 Okay, now imagine a game like Super Meat Boy on the iPhone ... but it actually works. 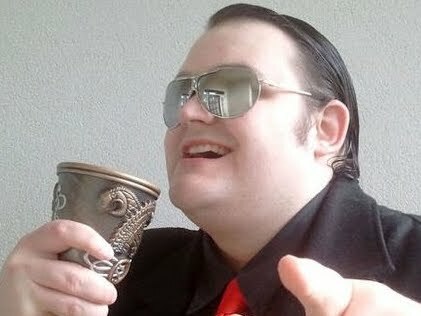 You've just imagined League of Evil, and it's pretty damn good. Even if it does make you want to snap your phone in half. 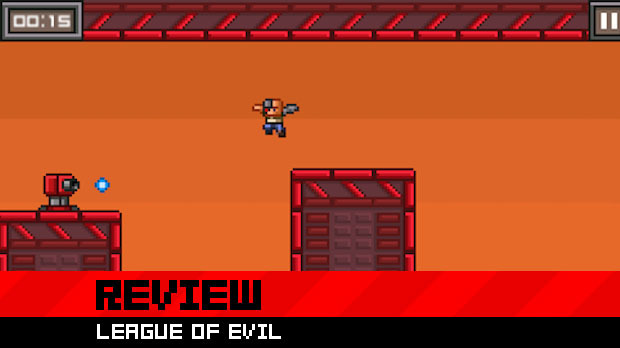 League of Evil is a sidescrolling platform game in which well-timed jumps and wall-bouncing are required to beat very short, difficult levels. If this sounds like a certain game first seen in 2008 by Team Meat, then you won't be far off the mark, as this game seems to wear its inspiration on its sleeve. It's not quite as difficult as Super Meat Boy's notorious hair-tearing levels, but Ravenous Games' effort is a noticeably trickier affair than most mobile gamers will be used to. There are several levels in which you will die often, punished cruelly until you learn to get it right. The game ranks you very strictly on your speed as well, so you have to combine care with swiftness, while also attempting to pick up a bonus briefcase hidden in each level. While the game's setup is incredibly similar to Team Meat's offering, both games feel suitably distinct. League of Evil has a slower pace and is less focused on meticulous precision jumps, instead placing the challenge more on old school platforming conventions. 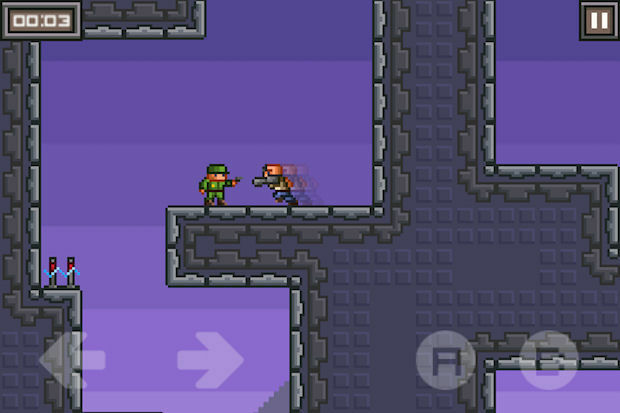 The protagonist gets a double jump, as well as the ability to slide punch and take out armed soldiers. It feels more traditional, but that works in its favor, distancing it from its inspiration and giving off that "retro" flavor that remains so popular with kids these days. Despite the slower pace, League of Evil is definitely challenging. Some levels don't mind murdering you with nasty surprises, but the short levels only serve to make a player more determined. By the end of certain stages, I wanted to throw my phone across the room, but the trials make the eventual victory (and it does always come) all the sweeter. This solid development would be for nothing if the controls were bad, and I have to say that League of Evil makes superb use of the format's limitations. Input is incredibly responsive and the simple, large, bold virtual buttons make running and jumping a simple affair. 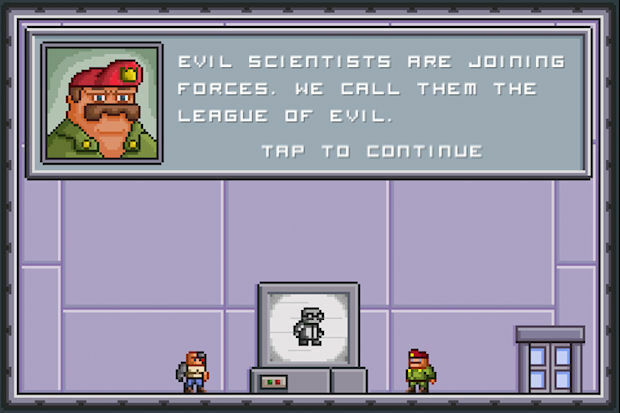 League of Evil offers some of the tightest controls I've seen in a mobile game, which is astounding considering the unforgiving nature of the platforming. Add to that a fairly typical -- but not altogether unpleasant -- 8-bit visual style and some cool music, and you've got a pretty damn good mobile game on your hands. In fact, aside from the fact that it has been released so close to Super Meat Boy with fairly obvious fundamental similarities, there's very little I could say against the game. It's got over fifty levels of content spread against four aesthetic themes, and while that can feel somewhat repetitive, the tight design and bite-sized nature of the challenges makes it a perfect fit for the iPhone. There's a slight feeling that this has been done before, and with more personality, in recent game releases, but you won't find an experience like it on your iOS device, not with controls this tight and user-friendly. Fans of challenging platformers and nostalgic design would do very well to pick it up.